22-year old guard Francisca Salvatierra (173-G-94) had an amazing evening in the last round for second-ranked Univ.de Chile and receives a Latinbasket.com Player of the Week award for round 11. She had the game-high 33 points adding three rebounds and two assists for Univ.de Chile in her team's victory, helping them to outclass Sergio Ceppi (#6, 4-8) with 46-point margin 93-47. Univ.de Chile maintains the 2nd position in Chilean Liga Femenina. They would have been even better if they hadn't lost a few games earlier this season. Univ.de Chile will need more victories to improve their 9-3 record. In the team's last game Salvatierra had a remarkable 73.7% from 2-point range. She turned to be Univ.de Chile's top player in her first season with the team. Salvatierra has impressive league stats. She is in league's top in points (2nd best: 20.8ppg), assists (9th best: 3.4apg) and averages solid 52.3% FGP. Second best performed player last round was Arlenys Gonzalez (185-C-87) of Boston College. She is Cuban center in her first season at Boston College. 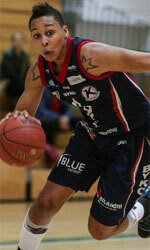 In the last game Gonzalez recorded impressive double-double of 25 points and 19 rebounds. It was enough for Boston College to edge the lower-ranked Libertad SF (#7, 2-10) by 4 points 71-67. Boston College's 4th position in the standings has not changed. Her team's 6-4 record is not bad at all. Gonzalez is a newcomer at Boston College and quickly became one of team's most reliable players. She belongs to the best scorers in the league with 20.8ppg (#3). She also registered 13.6 boards per game. Third place about best performers goes to Nisse Silva of Brisas (#5). Silva showcased her all-around game by recording 11 points, thirteen rebounds (!!!) and nine assists in the last round. She was a key player of Brisas, leading her team to a 67-54 easy win against the lower-ranked Univ.de Los Lagos (#8, 1-9). The chances of Brisas ranking at the top of the league, however are very questionable as they have already lost 7 games, recording just five victories. With bigger assistance of her teammates, Silva could help Brisas to bring them higher in the standings. Silva has a great season in Chile. After 11 games, she made it on the list of the league's leaders in rebounds with 9.3rpg (8th best) and assists with 4.8apg (3rd best). The Player of the week is chosen based on efficiency calculation, but also including game result, importance of the game, if played recorded double-double/triple-double, etc.